I always thought I enjoyed beer. I drank plenty of it in college and lived with the assumption that all beers tasted more or less the same. My favorite beer was Bud Light for no other reason than this is what my father drank. This relationship with beer suited me just fine until about five years ago. I was out celebrating a friend’s birthday which entailed taking a midnight bike ride down to the beach for a fire and some beers. The dénouement of the occasion was a bottle of Delirium Tremens. The ceramic-looking bottle was funky enough, but when the bottle came round and I smelled all that ester-y goodness, I was dumbfounded. By the light of an impossibly large moon aside a humble driftwood fire, this delicious bottle of DT made me giggle like a schoolgirl. I remember it excited me so much that I raved about it to my girlfriend the next day (who remained decidedly unimpressed). Though it seems ridiculous to state now (and to give you a sense of how powerful the macro beer cartel message is) I simply had no idea that beer could taste like that. And now I wanted to try every beer in the world. Fast forward to 2013(!) The term “beer snob” gets thrown around a lot in my presence, both by actual beer snobs and by the unwashed masses who have yet to have their own beer awakening. Though I try hard not to rise to the bait, I would not characterize my habits as snobbish. There are beers I like more than others (who doesn’t?!) but on the whole I love celebrating beer of all styles and quality. I have never, EVER poured a beer down a drain as undrinkable, which, if the comments from the various beer rating websites are to be believed, is something that happens all too often (and I’ve had some rather unappetizing beers). 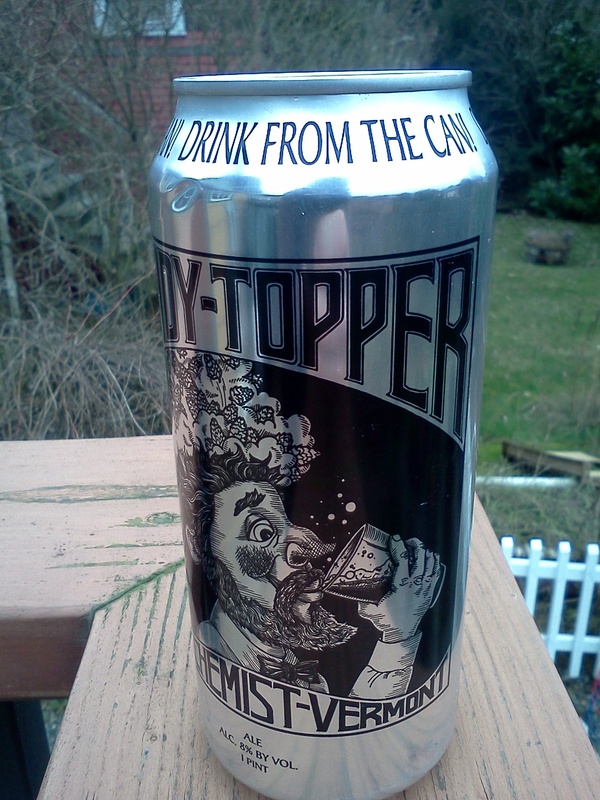 Recently I had the unique opportunity to try a Heady-Topper from The Alchemist in Waterbury, Vermont. Over and over I would hear from my East Coast friends that Heady-Topper is the greatest IPA they’ve ever had. Well, residing in the Land of Hops as I do, I felt like my brethren must surely be mistaken. IPAs from the West Coast are world-renowned. How could this tiny brewery in Vermont possibly compete? You’ll notice that the can instructs me (in all caps) that I should drink directly from it. The back of the can even explains why. Why do I recommend that you drink it from the can? Quite simply, to ensure a delightful, hop experience. The act of pouring it in a glass smells nice, but it releases the essential hop aromas that we have worked so hard to retain. Can’t argue with the logic. And the results make it difficult to refute the author’s claim. Sticking my nose in the little opening up top reveals a forest of pine trees, perhaps even a lumberyard. The beer itself is crazy bitter (120 IBU according to their site) but in a way that pleases me immensely. About half way through the can my palate is completely ruined and I can only slip into a dream-like haze induced by the 8% ABV. As of January 2013, The Alchemist only brews the one beer and it’s only available in retail outlets near Waterbury. If you’re in the area and have not yet tried this wonderful beer, you owe it to yourself to go now. And if you’re not in the area, it’s probably worth a trek anyway. Heady Toppah is wicked ah-sum bro. Less talk more grok. Looks good Mike! Keep it up. Glad to have provided the can that started it all!